The 2004 Subway 400 was a NASCAR Nextel Cup Series race held on February 22, 2004, at North Carolina Speedway in Richmond County, North Carolina. The race was the second of the 2004 NASCAR Nextel Cup Series season. Ryan Newman of Penske Racing won the pole position, while Matt Kenseth of Roush Racing won the race. The race was the final Cup race at the track due to poor attendance, as the race date was later given to Phoenix International Raceway; only 50,000 were in attendance at the 60,113 facility. The other Cup race at the track, the Pop Secret Microwave Popcorn 400, had been replaced by California Speedway after 2003. Ryan Newman, 2003's pole leader with 11, won the pole at Rockingham with a lap speed of 156.475 miles per hour (251.822 km/h) and a lap time of 23.398 seconds. Dodges were the top four fastest, with Newman, Jamie McMurray (155.379 mph (250.058 km/h)), Kasey Kahne (154.814 mph (249.149 km/h)) and Rusty Wallace (154.644 mph (248.875 km/h)). Chevrolet driver Jeff Gordon qualified fifth with a lap speed of 154.318 mph (248.351 km/h); Jeremy Mayfield (154.195 mph (248.153 km/h)), Dale Earnhardt Jr. (154.149 mph (248.079 km/h)), Jeff Green (154.117 mph (248.027 km/h)), the previous year's race winner Dale Jarrett (154.078 mph (247.965 km/h)) and Greg Biffle (154.026 mph (247.881 km/h)) rounded out the top ten. Morgan Shepherd and Andy Belmont failed to qualify after the two crashed in practice. The entry list for the race was short, which led to a group of field-fillers entering the race, including: Joe Ruttman, starting in his first Cup race since 1995, Kirk Shelmerdine, who made only two Cup Series starts since 1994, Carl Long, who started twice in 2001, and Andy Hillenburg, who failed to qualify for the 2004 Daytona 500. The four drivers were considerably slower than the 37 full-time teams; in comparison to Newman's qualifying speed, Hillenburg, who started 43rd, had a speed of 146.859 mph (236.347 km/h), a 9.616 mph (15.475 km/h) differential. Hillenburg, who ran just six laps in the two practice sessions prior to the race, expressed interest in running the full race, stating, "I don't want to look like we're trying to capitalize on anything, but this is our window of opportunity. We're not here to go two laps and try to get a check. We're here to do the best we can." After the race, rumors arose whether NASCAR had requested the field-fillers to appear and complete the 43-car field with the reward of money, possibly to satisfy television contracts, NASCAR vice president Jim Hunter denied the allegations. After one lap was completed, Joe Ruttman, who started 40th and did not make any attempts to practice, was ordered to park by NASCAR for not having a pit crew, and collected $54,196. NASCAR eventually admonished Phoenix Racing owner James Finch for the incident. Kirk Shelmerdine was lapped after eight minutes, and finished 42nd after not reaching the minimum speeds mandated by NASCAR, and was paid $54,895. Carl Long finished 38th after barrel-rolling on the backstretch. Andy Hillenburg managed to finish the race in 34th and 17 laps down, earning $55,425. Pole-sitter Ryan Newman led the first two laps before getting passed by Jamie McMurray, who led until the first caution flag was waved for Ken Schrader's crash in turns one and two. Jeff Gordon took the lead, leading until lap 53, when Kyle Petty crashed. McMurray and Robby Gordon exchanged the lead during the caution period, while Newman, Jeff Gordon and Matt Kenseth swapped the lead changes during the 71-lap green flag period, with Schrader and Jimmie Johnson's accident on lap 131 bringing out another caution. On lap 134, Kenseth claimed the lead, and led for 79 consecutive laps until lap 214, when a debris caution came out. Despite Kevin Harvick briefly taking first, Kenseth regained the lead, and led for 87 more laps. During those laps, on lap 265, Long collided with Joe Nemechek, flipped down the backstretch and landed in the turn 3 apron. With 42 laps left, Robby Gordon crashed, and McMurray eventually passed Kenseth and Kasey Kahne, but NASCAR ruled that Kenseth and Kahne were finishing their pit stops and were leaving pit road, and as the field was frozen, McMurray's pass was voided. Kenseth battled Kahne for the win, and on the final lap, defeated Kahne by .01 seconds, while McMurray finished third. McMurray's team owner Chip Ganassi confronted the NASCAR haulers about Kenseth and Kahne's wave around; Ganassi stated, "We just got robbed in front of 100,000 people." 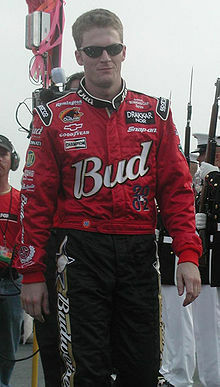 Dale Earnhardt Jr. led the points standings after the race. ^ a b "2004 Subway 400". Racing-Reference. Retrieved January 26, 2014. ^ "2004 NASCAR NEXTEL Cup Recap". HowStuffWorks. Retrieved January 29, 2014. ^ "Kenseth noses out Kahne to claim the Subway 400". St. Petersburg Times. February 23, 2004. Retrieved January 26, 2014. ^ O'Brien, Marty (February 21, 2004). "Newman Familiar With Pole". Daily Press. Retrieved January 26, 2014. ^ "THE RACE: Subway 400". Jayski's Silly Season Site. Retrieved January 26, 2014. ^ Hembree, Mike (February 20, 2004). "Newman commands attention". USA Today. Retrieved January 26, 2014. ^ Associated Press (February 21, 2004). "Newman takes another pole position for Subway 400". Online Athens. Retrieved January 26, 2014. ^ Hanley, Jim (February 28, 2004). "Joe Ruttman fills up more than race field". The Hour. Retrieved January 27, 2014. ^ Fryer, Jenna (February 21, 2004). "Slowpokes bring up rear of Rockingham field". USA Today. Retrieved January 27, 2014. ^ a b c Fryer, Jenna (February 24, 2004). "NASCAR calls Ruttman run 'a sham'". ESPN. Retrieved January 25, 2014. ^ Bromberg, Nick. "Wreck Week: Remember Carl Long flipping at Rockingham?". Yahoo! Sports. Retrieved February 18, 2014. ^ Joe D. (July 2, 2008). "Catching up with Carl Long". Bleacher Report. Retrieved February 18, 2014. ^ Diaz, George (February 23, 2004). "Kenseth holds off Kahne for Subway win". The Baltimore Sun. Retrieved January 26, 2014. ^ Aumann, Mark (April 5, 2012). "AUMANN: RETURN TO ROCKINGHAM REMINDS KAHNE OF 2004". NASCAR. Retrieved January 26, 2014.